Michael Turner (and now his son, Graham Turner) captured many scenes of motor sport (and aviation) on canvas. Several show Lotus Cortinas, and this one is my own personal favorite. 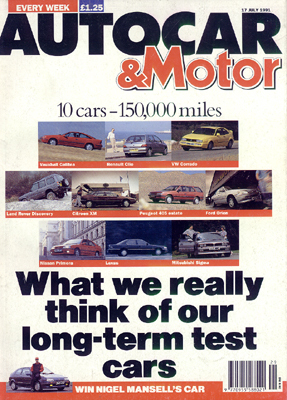 This commissioned work (sponsored by Castrol Motor Oil) was the inside front cover of Autocar and Motor Magazine, 17 July 1991 issue. It shows the Ford team being assessed for damage done by Jim Clark (on the left, black helmet) and co-driver Brian Melia (center) during the 1966 RAC rally, having sideswiped a rock outcropping near Loch Achray. All prints from the magazine (which can still be found in used bookstores and from collectors) have the visible "fold line" running down the center. But... you can purchase a very nice print (without the line...) by visiting Michael Turner's virtual gallery Studio 88, and emailing a request. 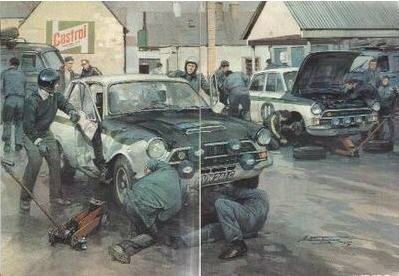 Read the inside fold-out explanation page, describing the 1966 Scotland Rally, and the commissioning of the artwork by Castrol, by clicking on the cover image below.